For the dapper acoustic guitarist with a penchant for an equally dapper resonator instrument, the Brown Derby Resonator gives a jaunty tip of the hat to phenomenal round-neck reso-phonic sound and style. 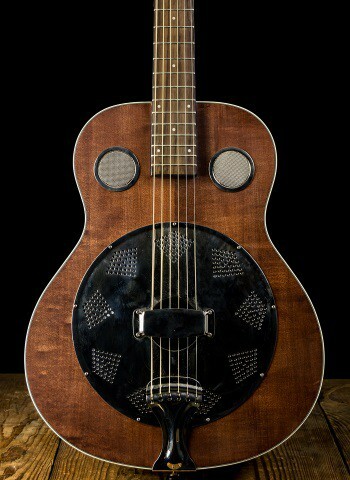 Pure resonator tone rings from the mahogany body and maple top, which features dual Fender “F” soundholes and a special Eastern European “Continental” cone of hand-spun aluminum. For an unmistakable Fender touch, a Telecaster headstock tops the mahogany neck, which also features a comfortable “C”-shaped profile and elegant French heel.